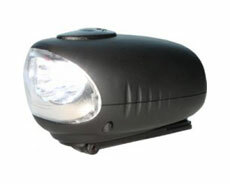 Canyon wind-up powered Bicycle LED Lights for a bicycle or rucksack. Perfect for when walking along those dark country lanes. Compact but powerful lighting for a bicycle or rucksack that doesn't need a battery or a bulb. 3 light modes giving up to 5 hours light when fully charged. This really is eco-friendly power. Red light version available for rear of bicycle.